I really like these for so many reasons (the “use what you have” idea and the “healthyish” taste!). Like you slicing biscotti makes me frustrated 😦 Yours (compared to mine) look perfect! 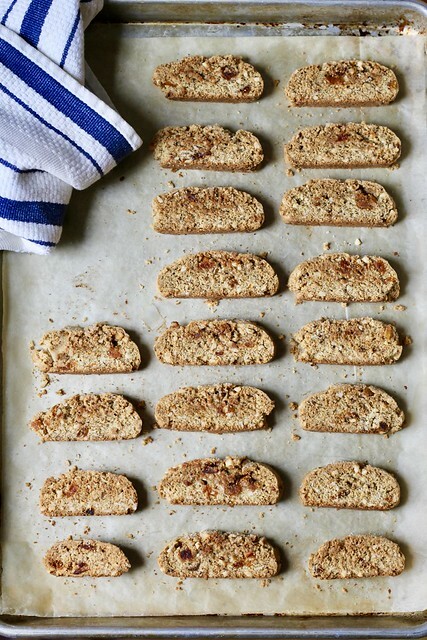 Your biscotti look perfect. For some reason I was able to slice without crumbling, a first for me. Maybe Dorie’s permission to crumble gave me courage? However you slice them, these were delicious. I only made half too. The cutting process is not fun, but I also ate the crumbles, which was not hard to do! These were healthy-ish and I enjoyed them very much. Glad you were able to use what you had on hand.